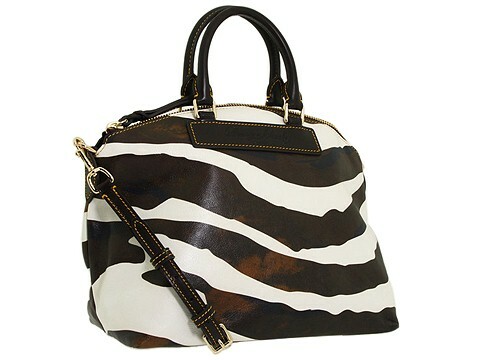 A fashionable stunner in Zebra animal print that will keep all your necessities at hand!.Not two zebras have the same stripes, so stand out in the crowd with this fabulous satchel. Holds your wallet, sunglasses, personal technology and a small cosmetic case. Dual handles with an attachable shoulder strap. Handle drop: 4 length. Shoulder drop: 13 length. Interior lining with a back wall zip pocket and multifunctional slip pockets. Dimensions: 14 1/2 wide x 7 deep x 10 1/2 high.